Need some extra light for your campsite but don’t want to spend lots of money? Tired of camping with just the pinpoint light of your flashlight? This homemade camping lantern is easy to make and provides a soft, ambient light that makes it easy to see. It can me made with things you will most likely have in your campsite already. Fill clear gallon jug with water and set on camp table or hang from sturdy object (like a tree branch) with cord or rope. 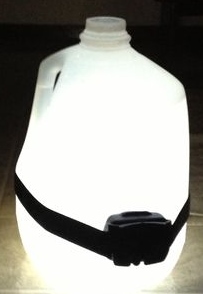 Affix headlamp to water jug and turn on. Enjoy the ambient light that your homemade camping lantern provides! P.S. You should know that you CANNOT make a lantern out of Mountain Dew, baking soda and peroxide as many web posts claim. It is chemically impossible without adding some fluorescent liquid such as the fluid in glow sticks. 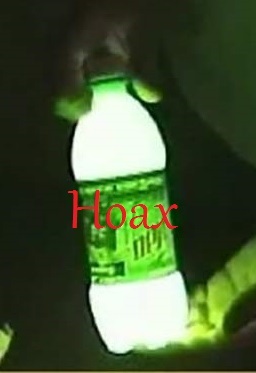 See video at PrepBusters Mountain Dew Glowstick. For more fun family camping ideas check out the Rolla Roaster blog at www.RollaRoaster.com. Posted in Camping and tagged camping, DYI, family camping, homemade, lantern, money-saver.